Spicy food lovers this one is for you!!! I have no idea what happened, I was not a spicy food lover at all until my second pregnancy. I became obsessed with putting hot sauce on everything! Even now, years later I have a real thing for a good kick! 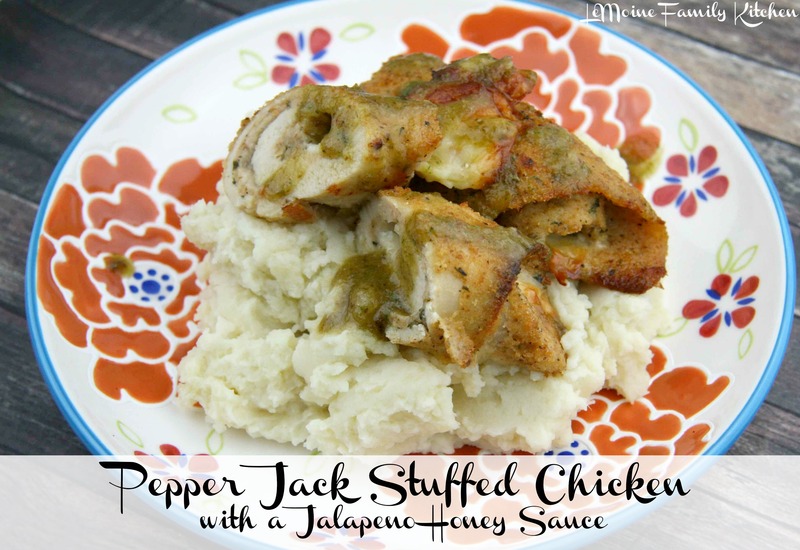 This Pepper Jack Stuffed Chicken with a Jalapeño Honey Sauce is incredible!! A simple breaded thin chicken cutlet rolled with a slice of spicy pepper jack cheese. Baked in the oven until golden and that cheese is just oozing out! The sauce, oh yes that jalapeño honey sauce is so incredibly flavorful! Its not by any means burn your lips off hot! This sauce is a perfect balance of sweet and spicy. A couple jalapeños and garlic cloves are lightly sautéed until golden. Into a blender goes the jalapeños, garlic, honey, red onion, red wine vinegar, cilantro, water and salt. We enjoyed this sauce so much that i’ll be making a large batch soon to keep in the fridge! Delicious! Coat the chicken with the egg and then into the breadcrumbs. Lay a slice or two of pepper jack cheese on each piece of chicken. Roll the chicken and secure with a toothpick or two. Place onto a lined baking sheet and cook for about 15-18 minutes until golden and cooked through. For the sauce. In a small frying pan, over low heat, add a few drizzles of olive oil, the sliced jalapeños and garlic cloves. Cook until the peppers and garlic are lightly golden. Place the peppers, garlic, honey, water, red wine vinegar, red onion, cilantro and salt into a blender. Puree until smooth. Serve the sauce overtop the chicken. It’s funny you say you developed your “thirst” for spice after your pregnancy because I used to be able to eat super hot and spicy foods and ever since my last pregnancy, I can’t handle too hot anymore, which really bums me out. This sounds like it has just the right amount of heat! I love the flavors of this dish. I like the spice and I like the compliment of the honey. Thank you Peter! Thats what i enjoyed most as well!